The Chinese Long March 2F rocket due to carry the Shenzhou 8 spacecraft to orbit in November 2011 rolls to the launch pad in Mongolia. PARIS — The Chinese government on Thursday (Dec. 29) issued a broad statement on its five-year space program, saying top priorities include developing three new launch vehicles — including a rapid-response launch system — and mitigating its contribution to space debris. The 17-page white paper, "China's Space Activities in 2011," reiterates China's focus on lunar exploration, with robotic lunar landers and a lunar sample-return mission slated for launch by 2016. The country's well-publicized development of its manned space station in low Earth orbit is also a priority. Chinese officials accustomed to criticizing alleged breaches of space etiquette by the United States came in for a large dose of international criticism following China's intentional destruction of one of its satellites in low Earth orbit in 2007. The maneuver, apparently designed to test a mobile ground-based missile launch system, left a large field of debris that will complicate satellite operations — including China's operations — in low Earth orbit for decades. The U.S. Air Force, using the U.S. Space Surveillance Network of ground radars, informed Chinese authorities of debris approaching Chinese satellites on 147 occasions in the 12 months ending in June, according to U.S. State Department data. The white paper, published by China's Information Office of the State Council, repeatedly returns to space debris as a concern. China's Long March rockets are being "fully deactivated" after mission completion to reduce the possibility of future explosion in orbit, the paper says. In addition, it says, operators of satellites in geostationary orbit 36,000 kilometers over the equator, the home of most telecommunications spacecraft, have begun "moving a few aging … satellites out of orbit." China's Beidou satellite-based positioning, navigation and timing constellation entered limited regional service in late 2011. By 2020, the system is scheduled to enter full global service with five geostationary satellites and 30 satellites in nongeostationary orbit. Beidou is one of four global satellite navigation systems, the others being the U.S. GPS network; Russia’s Glonass system, which in 2011 returned to operational status; and Europe’s Galileo system, still in development. The document says China is engaged in international discussions to coordinate satellite navigation radio frequencies to avoid interference. It makes no mention of China’s ongoing talks with the 27-nation European Union with respect to overlapping signals on the encrypted military-security signals planned for both Galileo and Beidou. The signal overlay will not cause interference for either system, but will make it impossible for either to jam the signals of the other without also jamming its own system. 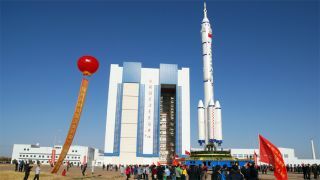 China’s Long March rockets have been, along with its manned space program, the most visible of China’s space priorities. In 2011, Long March vehicles set a record for annual launch activity, with 19 launches, including the successful launch and in-orbit docking of the Tiangong-1 orbiter and the Shenzhou-8 spacecraft, in preparation for China's future space station. Three commercial launches for non-Chinese operators were conducted — the Paksat-1R and Nigcomsat-1R telecommunications satellites for the Pakistani and Nigerian governments, with China providing the satellites as well as the launch; and the launch of Paris-based Eutelsat’s W3C telecommunications satellite. In a Dec. 27 statement, the China Great Wall Industry Corp., which commercializes the Long March vehicle family, said it plans to launch five non-Chinese satellites in 2012, including the Apstar 7 and Apstar 7B telecommunications spacecraft for APT Satellite Co. Ltd of Hong Kong. The white paper says the next five years will see completion of development of a fourth spaceport, in Hainan, and development of the Long March 5, Long March 6 and Long March 7 variants. The Long March 5 is being designed to lift up to 25,000 kilograms of payload into low Earth orbit. The Long March 6 is described as a "high-speed response" vehicle capable of carrying less than 1,000 kilograms into a 700-kilometer polar low Earth orbit. The Long March 7, it says, will be able to place a 5,500-kilogram satellite into the same orbit.